Through our Peer-to-Peer fundraising campaigns, your supporters can start their own campaigns to raise money for your organization. Whether it's for the memory of a family member, the celebration of a birthday, or participation in a marathon, Peer-to-Peer campaigns are a great way to mobilize your supporters. Visit our Peer-to-Peer page to search for your nonprofit or create a campaign directly from your nonprofit's CommitChange profile page. Upload a picture for your campaign and include a video introduction to what you’re raising money for and why you support this organization. Adding a video will boost your success and show the personal connection you have with the nonprofit you support. Technical note: We suggest uploads under 2 MB; pictures optimized for the web work the best. 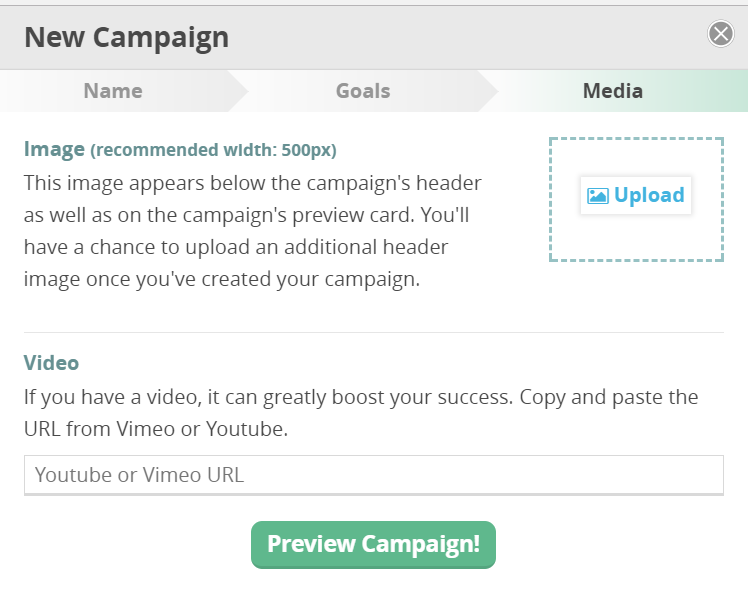 Preview your campaign. It is now in draft mode. You can change any of the above information you added in your Campaign Settings; the button to manage your settings can be found in the top Manage Campaign menu. 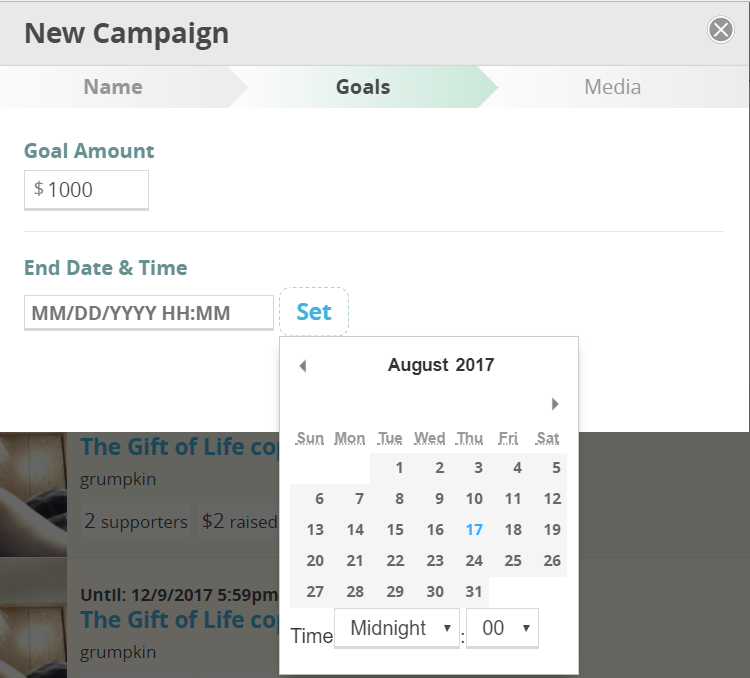 You can also customize how your activity feed, supporters, and goals appear on your page from the Settings screen as well as manage the page's media. Add gift options (the button for Gift Options is in the same menu as the Campaign Settings button). These give donors a chance to see the levels of donations you'd like to raise . 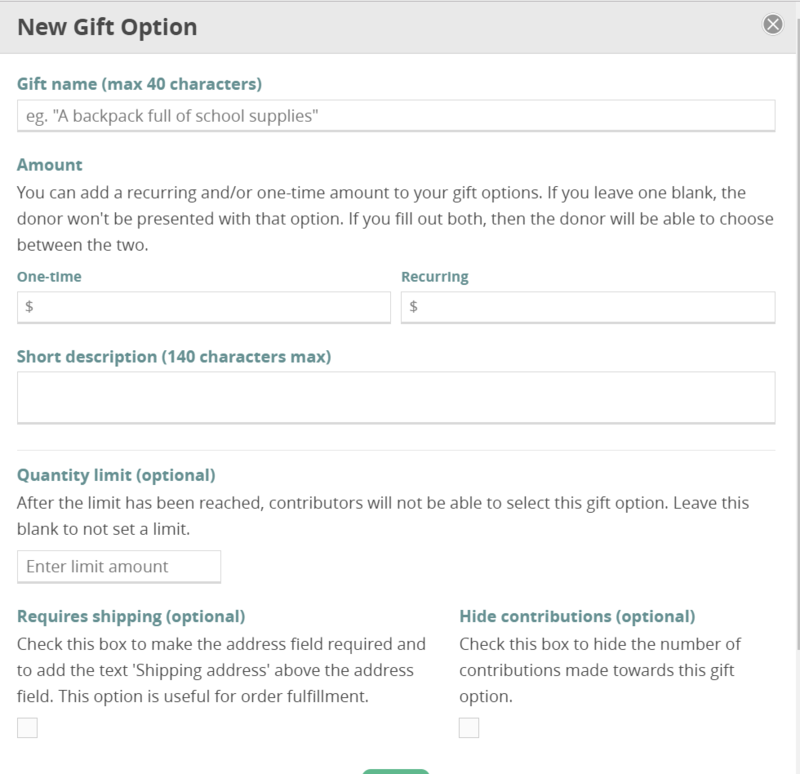 When you click on the Gift Options button, click on the New Button and a box will pop up with a form to set up your giving options. From the Manage Gift Options Menu, you can edit your options once they're created and re-order them. You have a lot of freedom over how to create gift options. 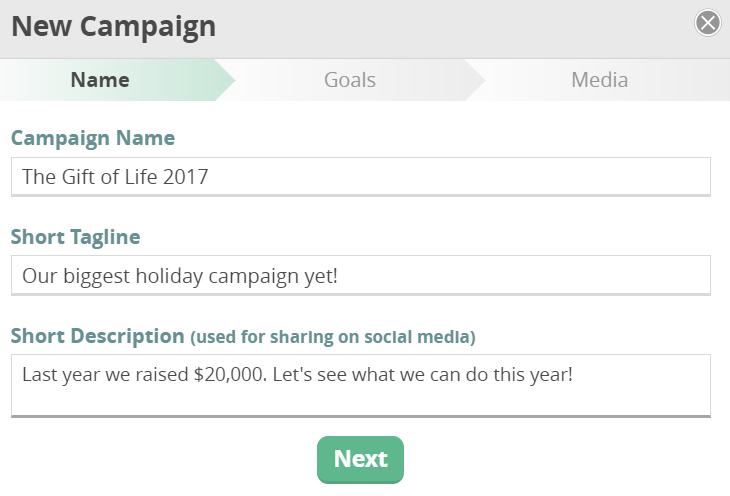 You can choose one-time or recurring donations and describe what each level can help achieve as well as limit the amount of a specific option (this comes in handy if you're offering fundraising incentives). Many nonprofits choose to describe the direct correlation between specific dollar amounts and what they mean for their organization as gift levels. You can model this on your own campaign by talking to a staff member at your nonprofit and asking what specific donation amounts might help them achieve, whether it’s buying four hammers for $20 or funding a scholarship for $500. It can’t be stressed enough; be sure to write an in-depth account of your connection to the nonprofit and its story. Make sure your donors know why they should support your cause. You can also add more photos of your organization and its impact. Press the Settings button to go to the Settings admin panel. 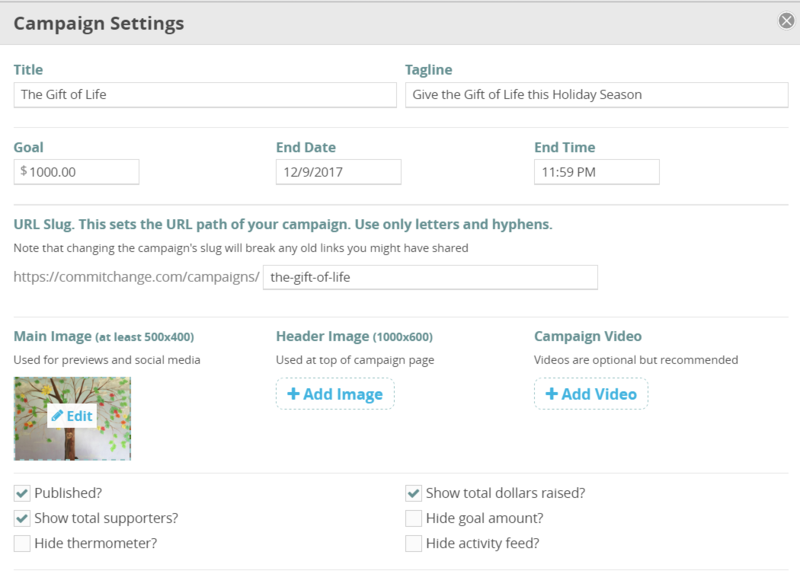 To publish your campaign, click on the checkbox next to "Published?" Scroll down and press the Update Campaign button to save your changes. Publishing your campaign won't change your campaign link or any of the campaign's functionality, but it will ensure that your campaign comes up in internet searches. If you do not publish your campaign, your supporters will only be able to find your page through a direct link.